The bee exploring the moss picture (second down) is just wonderful. I’m sure forager bees are often thinking ‘wheeee’ for getting their fully fledged wings and having the best fun! They will be having more fun when they discover the catkins on the willow. It should happen in a week or so. I wonder if the willow is of significance? I know that willow water (whips left in water for a couple of days) can be used as a growth hormone when planting cuttings, who knows! Thanks for thinking about my granddaughter. Her Mom says she’s starting to feel better. You know what it’s like when your child is sick (or teething) and there’s little you can do about it. I look forward to hearing about how your experiment goes. My sister used to use it on cuttings that she wanted to propagate, I have never tried it myself. Great video. 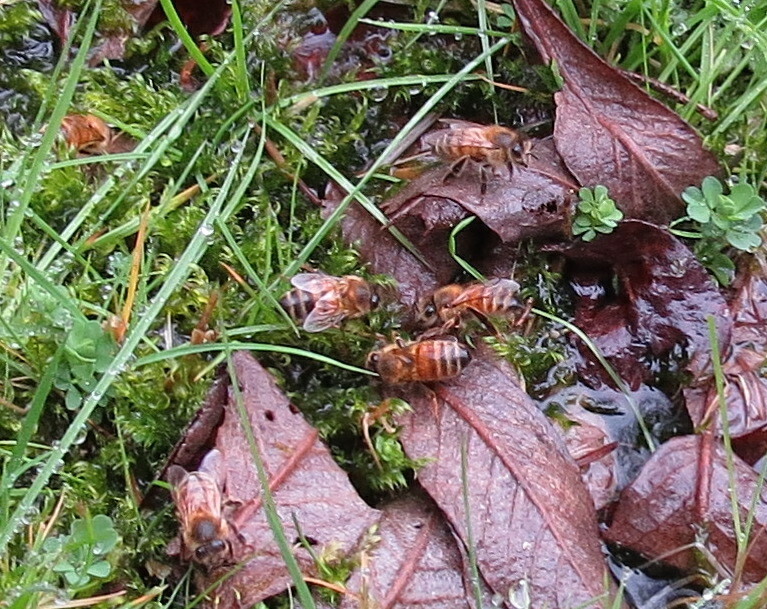 Damp moss is a safe way for bees to collect water. No danger of falling in. 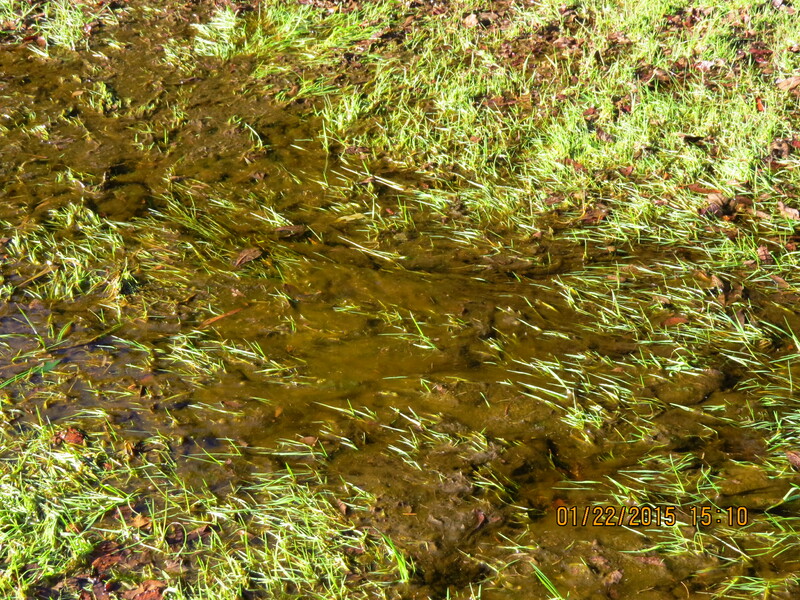 Are you seeing them preferentially use this patch over any nearby puddles? Wishing your wee granddaughter a speedy recovery. The bees seem to like this spot the most although I have seen them a time or two in front of Del’s Warre hive. The creek runs through a low field, but no bees could be found elsewhere. Very intriguing about the moss and bees. Bees are creatures that seem to have a reason for everything they do. I’d go for the idea that the mosses are exuding something into the surrounding wetness that the bees want. Thanks for your thoughts, Amelia. I remember reading about how aspirin was developed from willow, but that was way before I had willows growing, so it really didn’t stick. 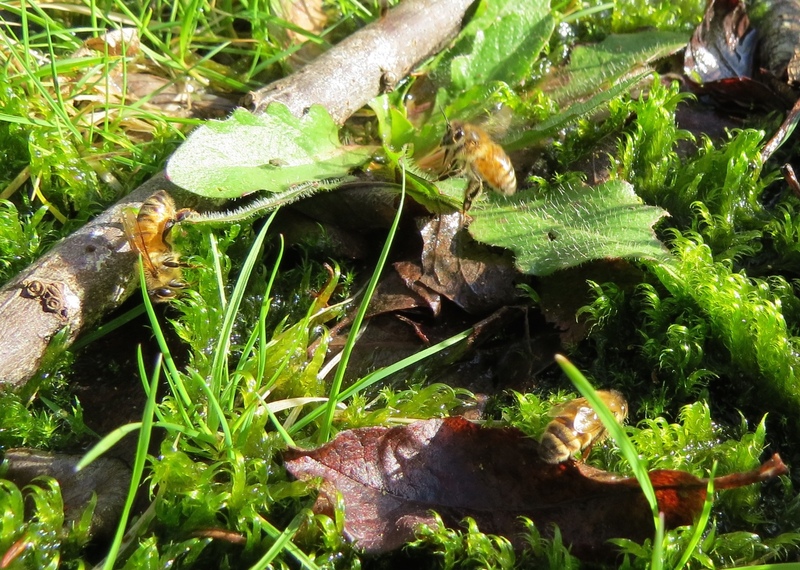 So it would be fascinating to think there might be a connection with the bees flying to that bit of moss where the willow leaves are and their immune system. I saw the bees there again today even with the rain falling and wind blowing. I don’t know about bears out there, Steve, you’d have to ask around. I haven’t been bothered here (east of Bandon), but I know the Two Mile area has bears. If you are using Warre hives, I will be building Warre sized boxes for nucs soon. Last year I had 9 or 10 swarms from three hives. This year I’ve got 8 hives, so I better get prepared. I don’t try to thwart the swarm behavior. Here’s a place to get Warre hive kits… http://www.beethinking.com (in Portland). You can also get the Warre hive plans online. Spend the extra $ to get the observation windows so you don’t have to inspect so often. Another thing you can do is to build some swarm bait boxes and try to get a swarm yourself. That’s what I did three years ago. I got three swarms and gave one away. Just to let folks know here is what I found out about bears in the area from the wildlife biologist who works out of the Charlston office: “Essentially all of Coos County has relatively high bear population densities and the Whisky Run area is no different. We have had problems with bears there in the past but nothing recently. Generally, the problems we have in that area are either nuisance problems where bears are tipping over garbage cans and getting into compost piles or bears are damaging timber by peeling the bark off of trees to get at the cambium layer and sugars in the sap. However, the problems we have in that area are no worse than other places.” Looks like an electric fence is in my future after I catch a swarm. Fabulous close-ups in that video. One theory I’ve read about why bees prefer ‘dirty’ water is that it’s easier for them to smell. Moss does have a particular smell which I quite like and perhaps bees do too. They may also be scent marking the spot they visit, encouraging other foragers to go there too. I have a Mossery where I cultivate a variety of moss species for landscape projects. I’ve marveled at this phenomena on many occasions. 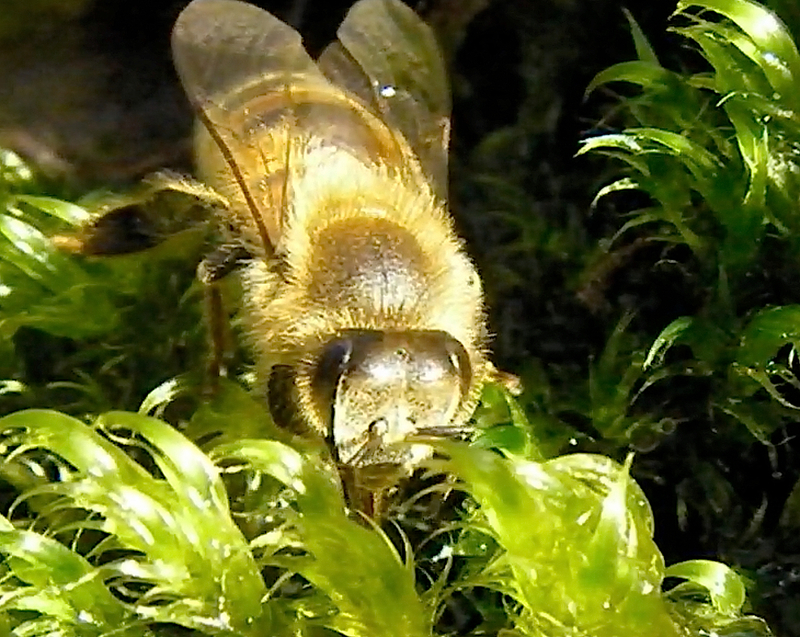 The bees actually come and sit on my moss mats for long sessions. They show a definite preference for moss over any puddles. At first, I thought that they were just chilling out for a bit of relief from the heat. 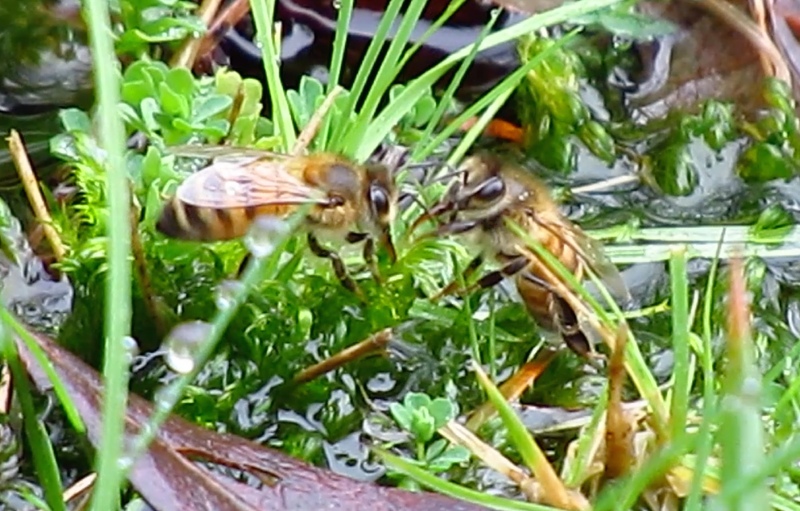 But, my beekeeper friends tell me that forager bees go retrieve water to take back to the hive. Since I water on a consistent basis, my moss mats are quite appealing to all types of bees and other pollinators. I have not observed any particular bryophyte (moss) species preference — just seem to like them all. As for antiseptic properties of moss, it is a specific genus of moss — Sphagnum species not just any moss. Indeed, Sphagnums are 99% bacteria free. Yes, please feel free to use my photos and/or videos in your lectures.